The weather couldn't have been better and the Dollar Mountain courses were great for 120 snowboarders taking part in the Intermountain Division United States of America Snowboard Association (USASA) snowboard series at Sun Valley last weekend. On Super Bowl Sunday for the halfpipe finale, Sun Valley Ski Education Foundation head shred Andy Gilbert crooned into the microphone, tongue-in-cheek, "Really, the only sporting event that matters today is what we're doing now." It seemed that way for 99 boardercross racers Friday and 115 slopestyle riders tending to business Saturday. They came from Oregon, even as far as Michigan and Minnesota. Gilbert said, "The word is out about how good a venue that Dollar Mountain is. It's so accessible for spectators—and Brian Callahan with his Park crew on Dollar deserves a ton of credit." Friday's 45-second boardercross course started from the top of Half Dollar, went through air features and into S-turns and double S-turns, through straightaways, rollers and the drag strip to the finish. Gilbert said it was tight racing for everybody. "Boardercross featured our up-and-coming Prep Team riders," Gilbert said. "For Saturday's slopestyle, kids could ride a big line or small line. The younger ones weren't being forced to hit a 50-foot jump and hold on for dear life. It was nice to have all the riders feel comfortable. We had a lot of first-time kids getting their feet wet." Highlights included good friends Clara Jenner and Payton Bacca battling neck-and-neck for four events in Menehune ages 10-11; podiums for Rex Kelly, Elk Spencer and Clyde Montgomery; Emerson McCune getting her groove back in Breaker girls (12-13) with three podiums; three Jam's wins by Dash Stethem; plus slopestyle victories by Wood River High seniors Sam Strong and Drew Deffe. Refocusing on slopestyle, national halfpipe champion Ali Appleton pocketed two bronzes in slopestyle and halfpipe. Pulling into the Dollar parking lot after an 18-hour trip from Michigan, SVSEF 16-year-olds Chase Josey and Ryan Roemer went 1-2 in Open halfpipe Sunday and then went home to bed, Gilbert said. Accompanied by coach Josh Keefer, they had competed in a Revolution Tour event Jan. 30-Feb. 3 at Ostego Club near Gaylord. There, Josey earned his second straight Rev Tour silver in pipe plus 13th in slopestyle. Triple-threat Roemer won the "Small Final" for 5th in boardercross, plus 16th in pipe and 7th (made finals) in slope. During last weekend's event, the SVSEF Snowboard Team presented its Beverly Hay Snowboard Cup honors, given since 1999 by an early and strong supporter of the team. The mid-season "Most Improved" team awards went to Emmy McCune and Elk Spencer. Combined race/event winners from last weekend, both from Park City, Utah, were Stormy McGuiness (Breaker Girls) and Caleb Lacey (Youth 14-15). Results for SVSEF Snowboard Team kids last weekend on Dollar, in order with Friday's two boardercross races (SBX), Saturday's slopestyle (SS) and Sunday's halfpipe (HP). Menehune girls (ages 10-11): Clara Jenner 1-SBX, 1-SBX, 1-SS, 1-HP; Payton Bacca 2-SBX, 2-SBX, 2-SS, 2-HP; Phebe Ericksen 4-SS, 4-HP; and Amelia Cookston 5-SS, 5-HP. Menehune boys: Elk Spencer 2-SBX, 8-SBX, 4-SS, 3-HP; Colton Donovan 8-SBX, 8-SBX, 9-SS, 7-HP; Austin Eggers 8-SBX, 6-SBX; and Lieder Schwartz 10-SS. 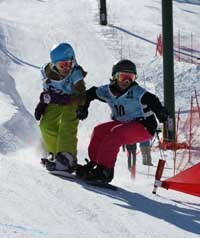 Breaker girls (ages 12-13): Emmy McCune 2-SBX, 2-SBX, 5-SS, 3-HP; and Cora Schneider 6-SS, 2-HP. Breaker boys: Clyde Montgomery 3-SBX, 3-SBX, 5-SS, 5-HP; and Colin Finnerty 8-SS, 6-HP. Junior boys (ages 16-17): Rex Kelly 7-SBX, 3-SBX, 7-SS, 3-HP; and Connor Smith 8-SBX, 7-SBX, 4-SS, 4-HP. Men's Jams (ages 18-22): 1—Dash Stethem 1-SBX, 1-SBX, 1-HP; and Sam Strong 1-SS. Men's Skier (ages 16-18): Drew Deffe 1-SS. Open women: Ali Appleton 3-SS, 3-HP. Open men: Chase Josey 1-HP; and Ryan Roemer 2-HP.